Since starting On Landscape I've mostly been reviewing either portfolio style books or new releases. I'd like to take a little departure from this to review a book I've had for a while now and which keeps catching the corner of my eye as it sits permanently on my desk. To begin with though, I'd like to introduce the author as it's his pedigree and knowledge that make this such an excellent resource. Jeff Schewe graduated from Rochester Institute of Technology with two degrees in photography and followed this up with a 25 year professional (award winning) career in photography during which time he was one of the first to use digital services and was an alpha tester of Photoshop 2.0. It was during which time he got to know the core Adobe graphics team of Knoll and Hamburg. Later he developed his own digital photography product company with Bruce Fraser, Pixel Genius. That this company's sharpening product was finally integrated with Lightroom is testament to the respect they have in the industry. So when Jeff produces a book called "The Digital Negative" and "The Digital Print", named after the all time classic texts "The Camera", "The Negative" and "The Print" by Ansel Adams, you know he means business. Why would I be so unequivocal? Because unlike many technical books where you get the feeling that the author has had to do their own research in order to make sure everything fits together (and inevitably gets some things wrong and fails to describe the things they got right particularly well) Jeff has this stuff ingrained in his DNA. He could probably have dictated this book ad lib as he juggles four mac pros and a Epson 3800! This book is all about the raw data that comes out of your camera. It starts by explaining what a digital negative is (the output bits that your camera creates - RAW) and explains each aspect, ISO, bit depth, colour space, noise, speed, ETTR (expose to the right). He also explains the camera aspects of the RAW file - lens aberrations, aperture, shutter, resolution, etc. Along the way he also adds in a lot of little side notes in coloured boxes that give you the sort of "Did you know?" extra information that adds texture to your knowledge. Throughout the book Jeff adds in a lot of little side notes in coloured boxes that give you the sort of "Did you know?" extra information that adds texture to your knowledge. For instance, "Did you know" that AdobeRGB was actually a botched pre-release of a Society of Motion Picture and Television Engineers proposed colour space called "SMPTE-240M"
For instance, "Did you know" that AdobeRGB was actually a botched pre-release of a Society of Motion Picture and Television Engineers proposed colour space called "SMPTE-240M". The original spec had an error in it and SMTPE asked for it to be corrected. However the colour space turned out to be quite useful as it encompassed quite a lot of the natural 'surface' colours and so Adobe created a new, corrected SMPTE-240M (which ended up as rec-709) and kept the botched version but renamed it to Adobe1998. It's little asides like this that give a little 'flavour' to the more technical sections that I particularly liked, whether they were directly useful or not. The following chapter introduces Lightroom, starting with an interesting background in the history of the software and the reasons behind it's creation. This gives a good basis of understanding why Adobe have the four products, Bridge, Camera Raw, Photoshop and Lightroom. Along the way Jeff also travels past digital image preservation, DNG and lossless/lossy compression. You might notice that things are quite Adobe-centric here and this is one of my only potential complaints about the book. There are many version of raw software and I think it could have been nice to mention them, if only in passing, and explain why they're different (i.e. dig a little bit into how the software 'de-bayers' the raw information). We'll forgive Jeff for this though as his personal history is closely associated with Adobe and he does it so well. In a big meaty chapter Jeff then introduces "The Fundamentals of Lightroom and Camera Raw". Now you have to keep in mind that the book isn't a step by step guide to these programs, it's more of a discussion of what these programs can do and why you might use them in a certain way. In some ways it's like a book version of some aspects of our Lightroom guides - it discusses why and how you might use blacks and whites, shadows and highlights; looks at curves and why you might use both curves and the basic section sliders. It continues through the whole of Lightroom and camera raws settings dialogs giving some great background information and context about each. The following chapter uses some sample images to show how you might use these controls in real world applications - particularly the local adjustments. And onto "Deploying Photoshop to Perfect your Digital Negatives" - in which Jeff Schewe shows that Photoshop and Lightroom work well together and shows some great tips in the process. Jeff also shows his background in sharpening here as there is quite a chunky section on how to sharpen images in different ways to get the best out of them. The last part of this section takes a brief look at HDR, Panoramas, Focus Stacking. Finally Jeff looks at how to construct a workflow using the tools described, and a very good way of working it is, especially for a photographer creating larger volumes of photographs. A final section of performance tweaking and that rounds out the book. The second volume of Jeff Schewe's epic mirrors Ansel Adams' in its title and also in it's authority. Jeff uses Canon and Epson printers as examples but the book is useful regardless of the printer you use. It starts with a discussion of the types of printer available, about buying a printer and then dives into the quagmire that is colour management. Thankfully the content is well described when referring to the theory of ICC profiles, illuminants, perception, metamerism, etc and has many practical points about how to load profiles, what to do with missing profiles, etc. It continues onto discussing how to make your own profiles for your camera, monitor and printer. All of this is a very good theoretical and practical overview of colour. What comes next is a wonderful look at how to put all of the knowledge from the Digital Negative and this book into practise in order to prepare images for print. This covers tone, saturation, colour, noise, sharpening, image sizing, interpolation, printer and image resolution, soft proofing and CMYK conversions. Once this is done Jeff talks about how to connect your printer to your computer and how to actually make that print in either Lightroom or Photoshop. For someone who struggles to work out or remember how this is done (and it isn't straightforward - there are more than a few gotchas) this section is a godsend. Finally Jeff talks about what exactly is a perfect print. How to choose paper, how to assess your print, frame, display and even how to sign it! Jeff isn't covering new ground here - much of this stuff has been talked about again and again in various volumes - but what he has done is distill the 'gist' of the whole process with enough practical guidance to accompany you through the learning curve from practised beginner (who knows a bit of theory and has tried things once or twice) to accomplished master. Don't expect to take all of this in in one sitting - this is a book you can come back to again and again. It ranges over vast amounts of ground but between this, wikipedia and the Lightroom and Photoshop help pages you'll be in good hands. 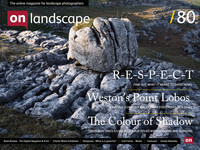 As I write this, and re-familiarise myself with all aspects of the two books, I realise that they are a great foundation for much of what we discuss here at On Landscape. We try to explain basic concepts and we also go into quite some depth at times but if you'd like a single printed resource to support what you learn about colour management, Lightroom, Photoshop and printing here at On Landscape then this is it. If you think you learn better visually then we can recommend Jeff's Lightroom videos at Luminous Landscape but if you want a couple of great, in-depth books about the whole image to print process you can't go too far wrong with these. If you own these books or have any questions about them please leave a comment below. ** OK there is one caveat - if you're an absolute utter beginner you might want to have wikipedia ready so that you can look up some of the references as he doesn't sit and explain exactly what every acronym and technical term means. And, again, if you are an absolute beginner don't feel like you need to know everything in these books - consider it a resource for dipping into as your knowledge develops and a signpost as to what to research; it will still be very useful but could scare you a little if you're a newbie.